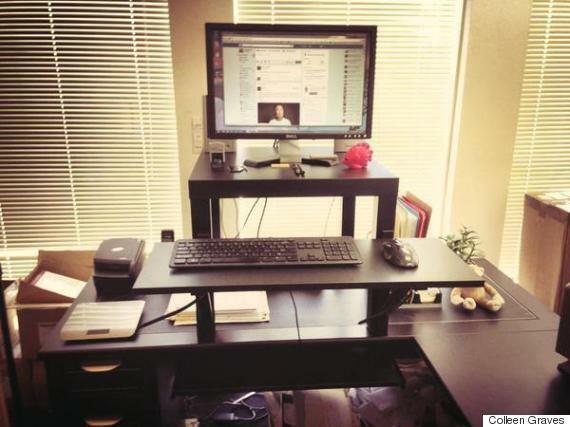 Interested in trying a standing desk but put off by the price? Check this out. Colin Nederkoorn, founder and CEO of Customer.io, has designed a simple base that can raise a monitor and keyboard up to standing desk height. Even better, it's constructed out of Ikea furniture that'll only run you $22. Nederkoorn named his creation the Standesk 2200. He recently told Bloomberg he initially tried to convert his desk by putting his monitor on boxes, but he couldn't find the right height. “Then we wondered: Could we do something with off-the-shelf Ikea parts?” he recalled to the outlet. To make your Standesk 2200, take a trip to Ikea for the Lack Side Table, some Ekby Valter Brackets and an Ekby Viktor shelf. The simply follow the instructions on Nederkoorn's blog. Research shows that sedentary lifestyles increase the risk of cancer and cardiovascular disease. ("Is sitting the new smoking?" some have asked.) Working at a standing desk is one way to reduce that. Considering that some standing desks will cost you a pretty penny, Nederkoorn's hack provides an affordable solution. Colleen Graves built the desk in the picture above to Nederkoorn's specifications. She told The Huffington Post that "it was extremely easy to make" and that she tweaked the design a little by using zip ties instead of screws to allow for future adjustments. In the week since she's built the desk, Graves said she's already seen big improvements in her health and her mood. "I was having extreme back aches, carpal pain, shoulder pain, hip pain, and I attribute all of it to sitting for long periods," she said.